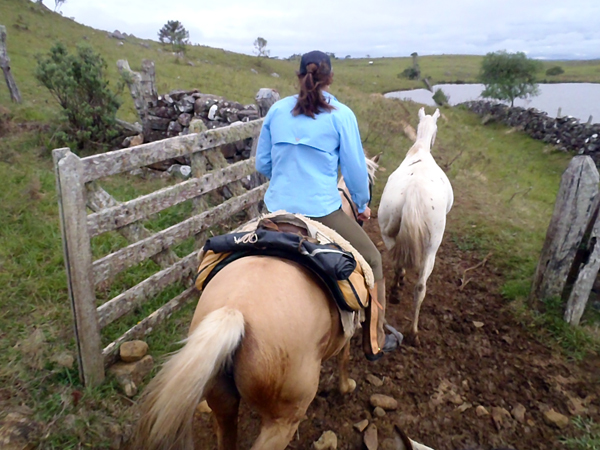 A rider finds an exciting dose of adventure and the good life on a Bazil riding vacation in rural Santa Catarina. Most fantasies are better left unlived in order to remain idealized and dreamy without disappointing us in flawed real life. As it turns out, the cowboy lifestyle is one meant to be lived. Rare even among the tiny percentage of romantic ideas that not only meet but exceed a dreamer’s expectations, it delivers a soul-satisfying experience for both living and adventuring well: freedom. The team at Gaucho do Brasil, a horseback adventure company in southern Brazil, promise visitors a riding vacation experience they have never had before, the kind of hair- flying and eye- watering exhilaration most of us have daydreamed since childhood. They could add to this the guarantee that, riding aside, most people have never lived the way they’re about to for eight days. Here is a world of serene wild surroundings and old-fashioned pleasures, a place where time stands still and then almost ticks backwards. Coxilha Rica is a high plateau in the Southern state of Santa Catarina. Three hours inland from the Santa Catarina coast, a high plateau the size of Belgium is home to 400 farming inhabitants, or Gauchos. The locals call this vast undeveloped land Coxilha Rica, naming it after its similarities to an undulating green ocean at nearly 2,000 feet above sea level. 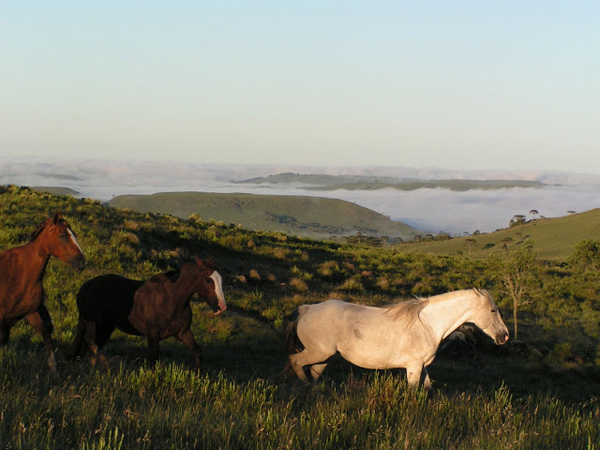 Almost entirely without roads or paths, this region of grassy hills, full rivers, and Araucaria forests maintains an arrangement between landowners that allows unrestricted passage of anyone mounted on horseback, even when it means riding through private livestock herds. This kind of access makes it possible to ride for days—literally—without seeing or hearing a motorized vehicle, a road, or any kind of modernized life. Twenty years ago, Brazil’s southern state of Santa Catarina branded the concept of rural tourism partly to share the quality of life found in its undeveloped regions and partly to ensure a livelihood without altering these untouched landscapes. But adventures like the Gaucho do Brasil tour are not just born from a plan to bring tourists into the country to pamper them. Instead, they have taken shape as a way to honor the good life, which is to say the simple life. That it includes such an exciting dose of adventure is the natural outcome of putting horses and humans together in a place as free and open as this. 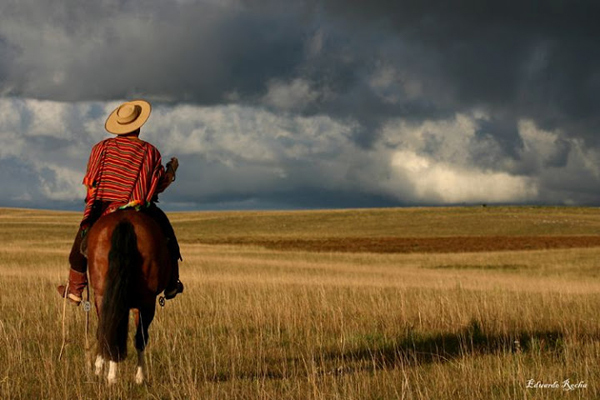 Travelers cross the pampas, not following roads or paths, for pure freedom. Photo Credit: Jec Aristotle Ballou. One night under a star-filled sky, I sat sipping the local sugar cane rum Cachaca and counting fireflies, then moved on to tallying other numbers from this week of unadulterated freedom. I counted the following results. Six—number of days since last seeing a motorized vehicle. Five- number of horses in our herd running loose alongside us. Zero—total hours I had cell phone signal. Four to seven—average hours spent cantering and trotting across open fields with warm sun and wind on our faces. Zero- the amount of complaints I could think of. Riders typically spend 6 to 7 hours in the saddle each day on this Brazil riding holiday. Since 2003, tour organizer Paul Coudenys has welcomed 100 visitors a year wanting to experience the freedom and simplicity of the gaucho lifestyle. They have come from Scandinavia, France the UK and only recently from the U.S., with my partner and I becoming the third and fourth Americans. Each in turn has drifted to sleep with the cawing of Curucaca birds and live guitar picking, been lulled to Zen-like relaxation from hours in the saddle, and returned home an entirely changed individual. The Brazilian Gaucho resides mostly in the southern states of Santa Catarina and Rio Grande do Sul. Coudenys himself knows a thing or two about how a taste of the gaucho lifestyle can change someone. An early pioneer of worldwide equestrian holidays through the company Hippo-Trek that he founded in 1996, Coudenys has ridden horses in 52 countries. He first visited Brazil in 1989, which he describes as an instant love affair. After years of commuting from his home base in Europe, Coudenys settled full-time in Santa Catarina and now focuses solely on Gaucho horse holidays. 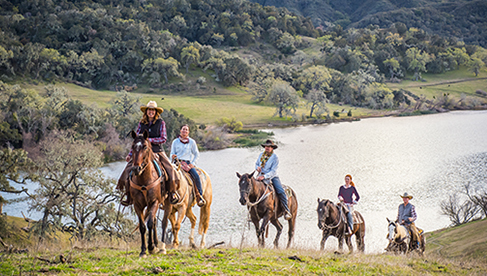 A typical Gaucho horse adventure takes groups of five to ten riders out on the trail for six days of riding with a day before and after to rest, eat, and bask in warm hospitality. The Gauchos always run four or five horses loose alongside the ridden horses, adding to the sense of pure freedom for riders like myself unaccustomed to riding with unsaddled horses galloping next to me. 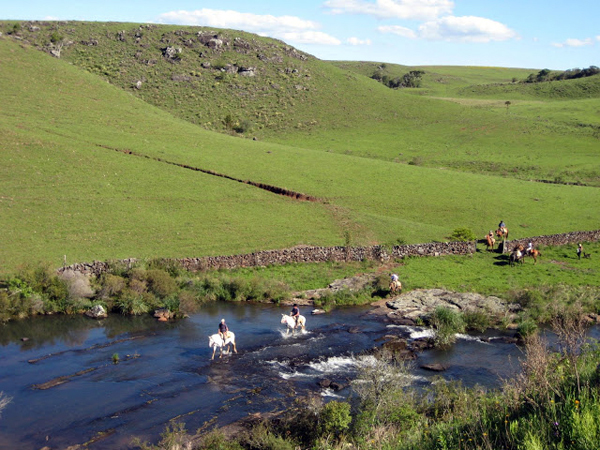 On this Brazil trail-riding holiday, travelers stay in authentic working fazendas (ranches). Actual routes for these adventures follow whims more than maps or footpaths. 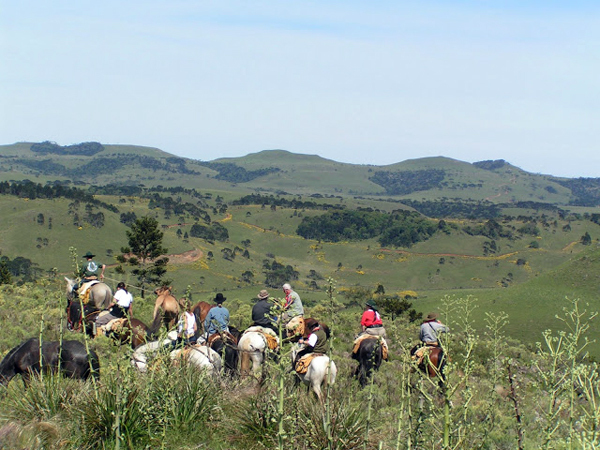 Coudenys waits until a few days before the trip to set the route, based on which fazendas, or ranch families, might have cattle work on their agendas, in which riders get to participate. 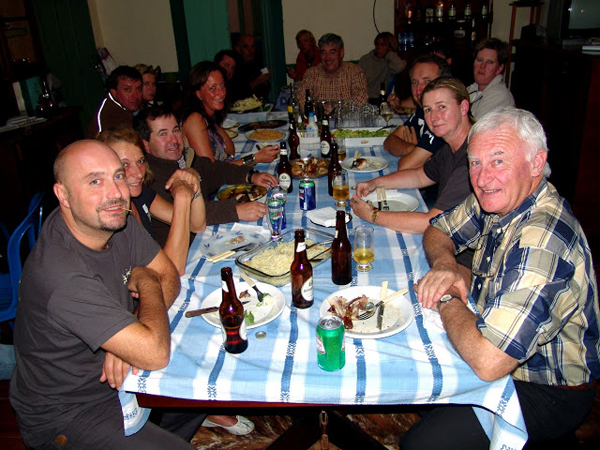 Each day the group rides four to seven hours to a different fazenda and stays overnight. Lunch occurs somewhere along the trail, most often prepared from the saddle bags under a shade tree. 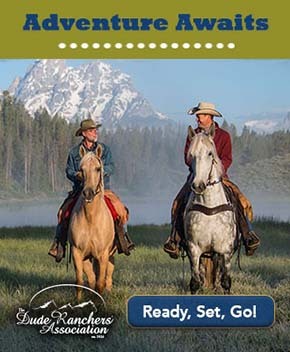 Being a professional horsewoman who has ridden in several countries, I fretted before arrival about whether our ride would be a nose-to-tail meander or a bona fide cowboy romp. I didn’t want to find myself half the world away bored stiff in the saddle. This worry about any lack of thrill or sublime beauty proved unwarranted, embarrassingly so. 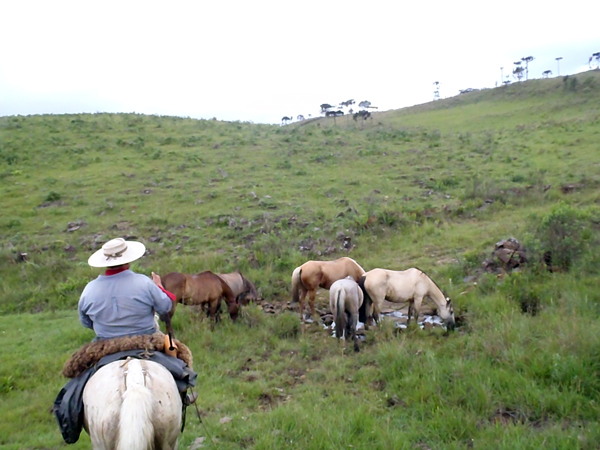 Riders mount Criollo horses for their adventures through the rolling hills of Santa Catarina. My travel partner and I were originally scheduled to join a group of Europeans that canceled three weeks before, leaving us in a lucky scenario of a private trip with two exceptional horsemen for guides: Giancarlo Olsetta and Roberio Bianchini. 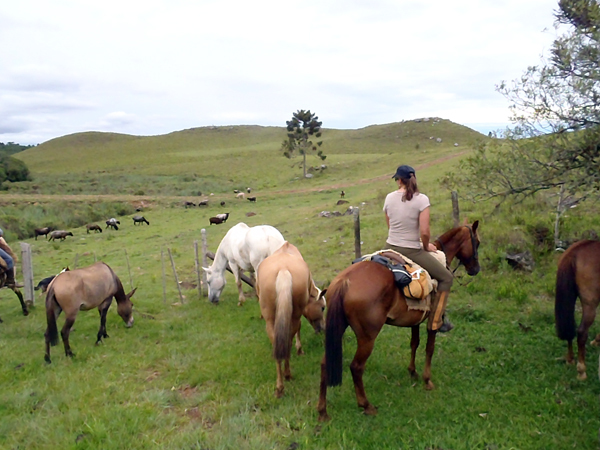 Bianchini, a lifetime resident of Coxilha Rica, maintains the herd of fit and well-mannered horses used on these trips. 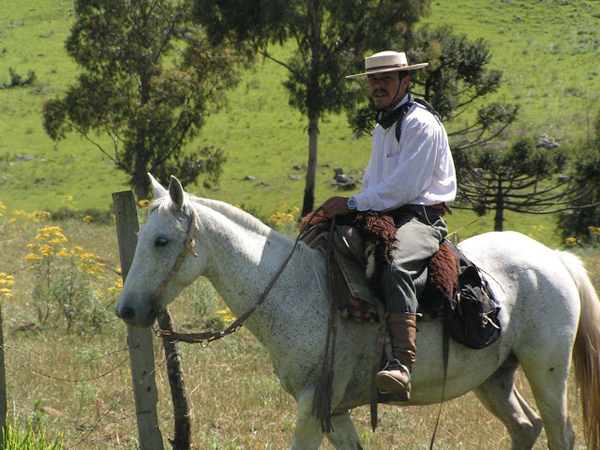 A long-time horseman, Bianchini’s photo appears in several tourist books about Santa Catarina and its horse culture. Local farmers joke that horse blood runs through his veins; his whole life revolves around his four-legged steeds. Another joke circulates that Bianchini and Olsetta together are a human version of GPS, managing to find their way through dense forests and rolling fields by reading only the skyline and vegetation, never once getting turned around. Our ride did in fact seem at times ad-libbed, though never off course. Bianchini would occasionally pause for a moment, trace the horizon like an owl and then point in one direction. Olsetta would take off in that direction with us cantering beside. We moved on like this with Bianchini taking route cues from each cluster of pine trees or the boundary of a basalt stone wall. We never once followed any trail visible to the naked eye. 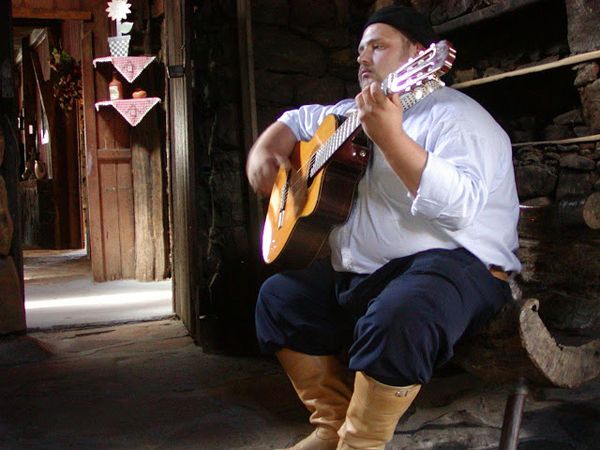 A gaucho serenades a riding group. You may also hear accordion music during your adventures. On our fourth day in the saddle, I had one of those epiphanies that hit people after long periods in nature. We were cantering behind our five loose horses running out front around the bottom of a granite escarpment, slick with sweat under an afternoon sky. We were heading towards a horizon so far away in this wide unfenced terrain that my eyes strained to find it. I realized two things in that instant. First, I noted how light I felt from head to toe, almost weightless. Second, I acknowledged just how small and basic my needs were. I was not just fully awake in the present moment, I was engrossed with it. At lunch a little later, we leaned against the side of a deserted barn while Roberio and Gaincarlo built a fire inside a barrel to cook fresh fish skewered on spare wire they found. They discovered an onion patch nearby and plucked one of the larger bulbs from the soil, adding this to the fire for our meal. Then, realizing they forgot to bring cutlery, they twisted strands of wire fencing into primitive forks. My traveling partner and I shared a smile at this. Without speaking a word, we both knew we had found exactly what we were looking for. We chose Gaucho do Brasil as the center point of our trip to a country quickly becoming a trendy destination from a desire for authentic travel rather than comfy, conventional tourist experiences. We wanted to see real life in unspoiled places, not the handful of famous spots photographed for every magazine. 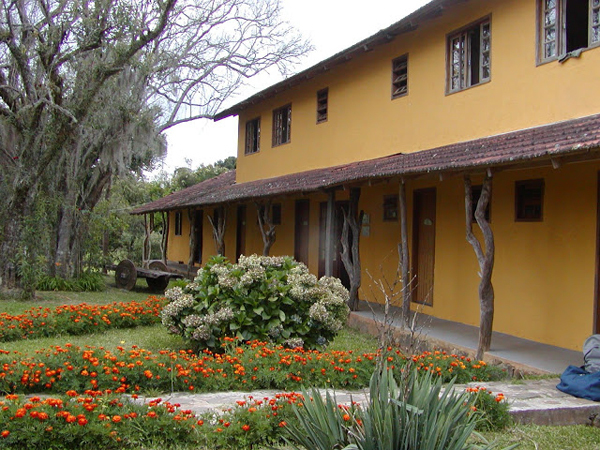 On this Brazil trail riding vacation, nights are spent at different colonial fazendas, many of which are over 200 years old. 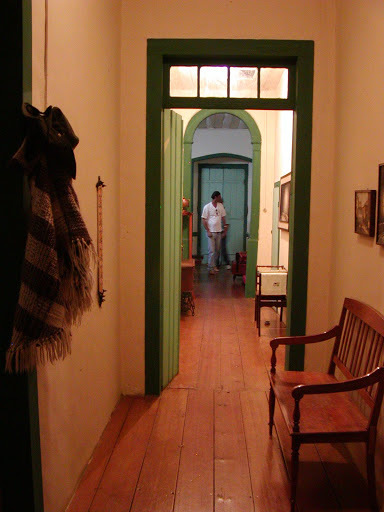 Rooms are filled with antique furniture and large country kitchens, making for an authentic "locals" experience. The following morning, we stuffed overnight clothes and toiletries into our saddle bags and rode 21 kilometers south to spend the night at Fazenda Lua Cheia, a busy cattle and sheep ranch. An inky grey sky covered us with a threat of rain and kept the heat away. I rode the morning aboard the lone burro in our herd, a mighty little guy with a trot as smooth as a rocker. He had spent the week running loose alongside us and when I asked if anyone ever rode him, Robeirio grinned and said “Yes… you!” I told him I was willing to give it a try, figuring I would need to hoist my knees skyward during deep water crossings. Sure enough, the first mud bog nearly sucked the little fellow in with me falling over his neck. We wobbled and teetered. He surged with all his might while I grabbed the few mane hairs he had for balance, and we made it safely to the other side in time to see a pack of wild boars flushed out of the underbrush by other riders. Their round black rumps bobbed away across the pampas to our right. My burro gave himself a shake and then resumed his steady pace. After a morning stop for Mate tea and a visit with a family of Criollo breeders, we descended a grassy canyon where we encountered a loose stallion that began circling our herd, wild with hormones. Giancarlo and Roberio cracked their whips with no urgency and sent us galloping towards the next fence gate where we stood a chance of separating him from our herd. The stallion charged our mares, whinnying and grunting. A moderate panic started to clench my throat. Even as someone who makes a living with horses, I had no clue how to handle this situation. Without any idea how worried I should be or what action I should be taking, I turned behind me to Roberio. He looked so relaxed and at ease he could have been reading a magazine. 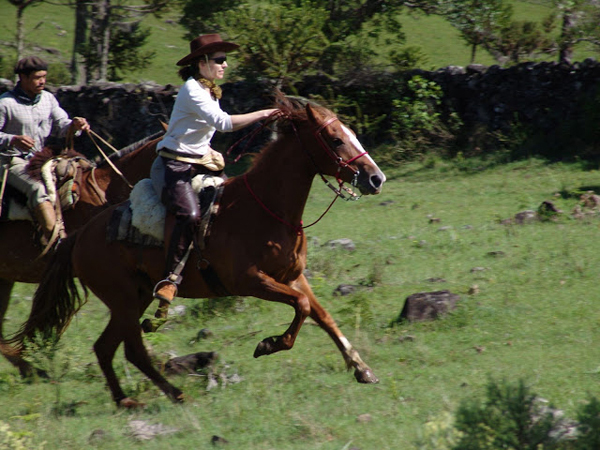 Travelers experience Gaúcho style riding, similar to western riding and trail riding. If I didn’t know better, I would think this kind of situation happened daily, with the end result always being just fine. After all, that seemed to be the Gaucho motto: everything is good. This kind of Gaucho ease towards life would be illustrated over and over throughout our week. Each time it made me ponder how much we Americans who claim such a hold on things like dreams and freedom and ideals can learn from Gaucho immersion. Criollo horses are strong with good bone and sound, hard feet. Still giddy with the thrill of having outrun a loose stallion across a wild expanse, we descended a boulder-strewn gulley towards a small wood barn. Dark green hills sloped away from us on either side. At the bottom, we rode across a clearing towards a pond where our horses could sink knee deep in the boggy edges for a drink. My buckskin dipped her muzzle and slurped. This was when, languidly observing the surroundings, I had my first encounter with Capivaras. A group of them sat on their haunches camouflaged on a copse across the pond. Looking like small hippos crossed with prairie dogs, the Capivara holds the title of world’s largest rodent. As my buckskin drank, I pondered if this strangely adorable beast only evolved in areas like Coxilha Rica where all this good, simple life didn’t mandate having a functional or fierce form. The pack across from us sunbathed and snorted at each other through fat faces that lacked any element of intimidation. My own form increased at our next stop—lunch. We arrived at a small weathered farmhouse where the woman of the house, whose name I failed to capture due to language barriers, treats Gaucho trail riders to a feast of traditional foods. For our small group, she prepared 17 separate homegrown dishes for us to try. She and her husband live almost entirely from their modest acreage, traveling just twice per month an hour to town for staples like flour and hardware. Riders enjoy plentiful meals after a long day of riding. I paced myself through as many plates as I could, but hit my limit well before sampling everything. I began with pickled onions and a boiled veggie hash then progressed to both carp and trout—caught from the pond outside the door-- lightly breaded and fried. Following roasted potatoes, mashed manioc root, and hard boiled quail eggs, I moved to dessert of caramel mousse. The churrasco, a kind of barbecue, is a local tradition in Southern Brazil. The next morning while switch-backing down from white-flecked basalt cliffs aboard a chestnut colored mare with endless stamina, I recalled the abundance of that meal and all the others like it in which we indulged. Such seemingly excessive effort of home cooking is not a special occasion in this part of the world, nor is it an activity reserved for when there is enough time. It is the only way things are done, regardless of time. Everything is baked, caught, and made by hand. Goods are sewn, grown, or crafted and not because it seems trendy to do so but instead because there is no other way except this simple, mindful one. A gaucho rides on a comfortable sheepskin saddle. 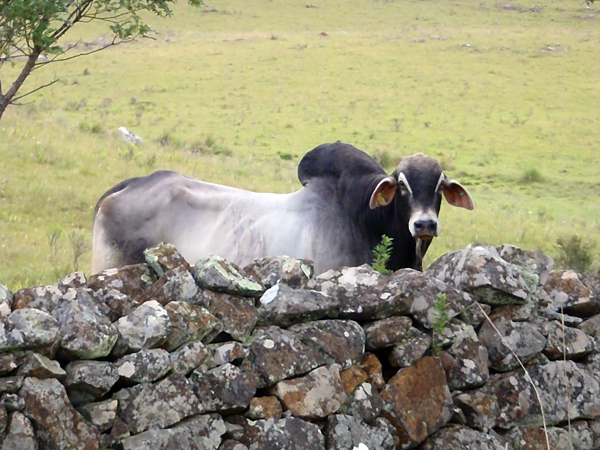 I reflected on our own culture for the next hour as we rode past hump-necked Brahma bulls. Finding enough time for the simple act of growing and making our own food is a piece of simple living that has spun out of our hectic lives. It now races up and down the margins with other abandoned pursuits that require inner relaxation, or gaucho ease, like long unhurried conversations, enjoying nature, finding ways to restore ourselves. Rounding up cattle with the gauchos is part of the adventure of a riding vacation in Brazil. After eight days in Coxilha Rica, I couldn’t even recall what other aspects of daily life were so important to gain priority over these. As I joined the roster of Coudenys’ visitors permanently changed by this wild and yet serene place, nothing felt more important than nurturing the state of inner calmness that living like a cowboy instilled. My priorities had been re-shuffled and re-ranked. Now at the top of the list was something I lacked a name for before: Gaucho spirit. Learn more about Brazil horseback riding holidays at EquitrekkingTravel.com, which features great international riding vacations.